For the United States Ambassador to Brazil, see Herschel Johnson. Herschel Vespasian Johnson (September 18, 1812 – August 16, 1880) was an American politician. He was the 41st Governor of Georgia from 1853 to 1857 and the vice presidential nominee of the Douglas wing of the Democratic Party in the 1860 U.S. presidential election. He also served as one of Georgia's Confederate States senators. Johnson was born near Farmer's Bridge in Burke County, Georgia. In 1834, he graduated from the University of Georgia. He studied at the private law school of Judge William T. Gould in Augusta, Georgia and was admitted to the bar. He moved to Jefferson County in 1839 and began to practice law in Louisville, Georgia. In 1844, Johnson moved to the state capitol, Milledgville, where he continued to practice law. Herschel V. Johnson around the time he ran for vice president. He unsuccessfully ran for Congress in 1843. In 1844 he was a presidential elector, and cast his ballot for James K. Polk and George M. Dallas. 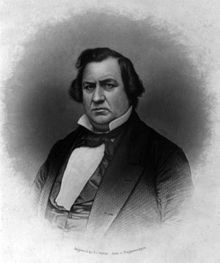 He ran unsuccessfully for governor in 1847, and lost the Democratic nomination to George W. Towns; Towns won the general election, and in 1848 he appointed Johnson to the United States Senate seat vacated by the resignation of Walter T. Colquitt. Johnson served from February 4, 1848 to March 3, 1849, but was not a candidate for election to the seat. He returned to Georgia and served as a circuit court judge from 1849 to 1853. In 1853, he was elected Governor of Georgia, then re-elected in 1855. After he finished his term as governor in 1857, Johnson County, Georgia was named in his honor. In 1860, when the Democratic Party refused to add the support of extending slavery to the western territories to its platform, the party split. 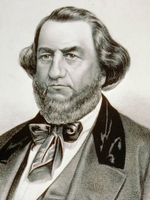 To try to recapture some southern votes, Johnson was chosen as the northern Democrats' nominee as the running mate of presidential candidate Stephen A. Douglas. He was also a slave owner. In 1840, he owned 34 slaves in Jefferson County, Georgia. In 1850, he owned 7 slaves in Milledgeville, Georgia. He also owned 60 additional slaves in Jefferson County, Georgia. In 1860, he owned 115 slaves in Jefferson County, Georgia. In 1861 he served as a delegate to the state secession convention, and opposed secession from the Union. When it became clear that Georgia would secede, however, he acquiesced out of loyalty to his state and served as a senator of the Second Confederate Congress from 1862 to the end of the war in 1865. In the Confederate Senate, he opposed conscription and the suspension of habeas corpus. After the Civil War, Johnson was a leader in the Reconstruction and was named head of the Georgia constitutional convention. Upon Georgia's readmission to the Union in 1866, he was chosen as a U.S. Senator, but was disallowed from serving due to his allegiance to the Confederate States of America. He again became a circuit court judge in 1873 and served until his death in 1880 in Louisville, Georgia. ^ Dixon, David T. (Fall 2010). "Augustus R. Wright and the Loyalty of the Heart". Georgia Historical Quarterly. 94 (3). Retrieved 14 June 2016. ^ Wortman, Marc (2009). The Bonfire : The Siege and Burning of Atlanta. New York: PublicAffairs. p. 94. ISBN 9781586484828. Retrieved 14 June 2016. ^ 1840 United States Census, United States Census, 1840; District 85, Jefferson, Georgia;. Retrieved on 6 March 2016. ^ "1850 United States Census, Slave Schedules", United States Census, 1850; Milledgeville, Baldwin, Georgia;. Retrieved on 6 March 2016. ^ "1850 United States Census, Slave Schedules", United States Census, 1850; District 48, Jefferson, Georgia;. Retrieved on 6 March 2016. ^ "1860 United States Census, Slave Schedules", United States Census, 1860; District 85, Jefferson, Georgia; page 464-465,. Retrieved on 6 March 2016. "Herschel Vespasian Johnson". Find a Grave. Retrieved 2009-04-24. Clark, Richard H., "Biographical Sketch of Hon. Herschel V. Johnson" Sunny South, June 26, 1875. Digital Library of Georgia. 1. The Democratic Party split in 1860, producing two vice presidential candidates. Johnson replaced Fitzpatrick as the official nominee by the Northern Democrats; Joseph Lane was nominated by the rebel Southern Democrats. This page was last edited on 16 February 2019, at 11:00 (UTC).